Watch out! This pair of KILLER Chanel heels could get you into some trouble. Socialite Tara Palmer-Tomkinson was arrested a couple of days ago at Zurich airport’s security checkpoint for carrying these babies in her luggage. 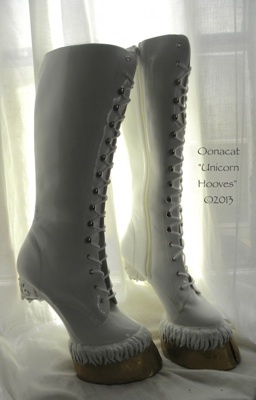 The shoes are designed by Karl Lagerfeld and Madonna has also been known to rock the Chanel Satin Gun Heels. 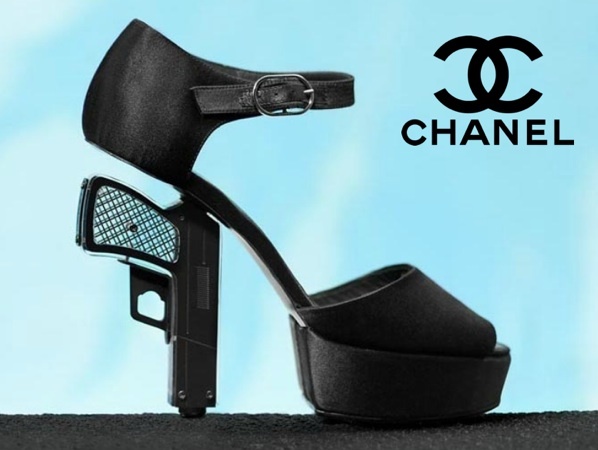 Gun laws may need some attention with these fashion weapons. At first glance these four little bottles may look like your staple nail polish set but think again – they’re actually highlighters! The cute set called Highstylers can be purchased for $7.95 on BaronBob.com. These office supplies will definitely be the ‘highlight’ of your stationery collection and for all the working gals – you can now highlight in style. 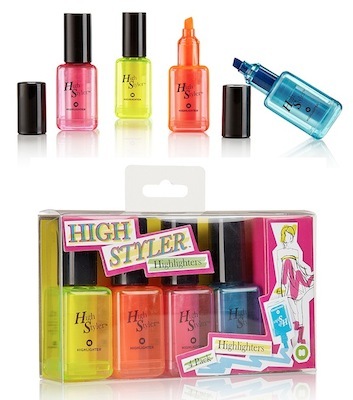 Each set comes with a pink, yellow, orange and blue Highstyler. It’s practically a manicure for those boring notes and text books! 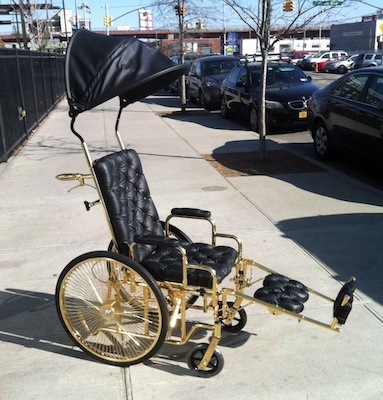 This past weekend at the famous South by Southwest (SXSW) conference, the smarty-pants at Google showed up with their latest prototype: a pair of talking shoes. The motion sensing, “smart shoes” have an embedded speaker on the tongue that can talk to you if they sense you are being lazy, not moving enough or encourage you when you’re moving or exercising. The shoes were designed in collaboration with Adidas and can relay the information to your smartphone. For example they can tell you how fast you are moving. Google has given new meaning to what the tongue of a shoe is meant to do with these smart sneakers, which is to smack-talk its wearer in this case. The shoes aren’t for sale but we’re wondering just how advanced the technology could get. Hopefully for most people the shoes won’t get too “smart” and be able to detect things like foot odor. Just imagine getting shouted at by your shoes saying, “Yo bro, your feet stink!” Nevertheless, sneakers just got a whole lot smarter thanks to Google. Hamster Trolls Policeman (In Russian)! No Russian language translation is needed to watch this “Hamster Trolls Policeman” video in order to get a laugh. 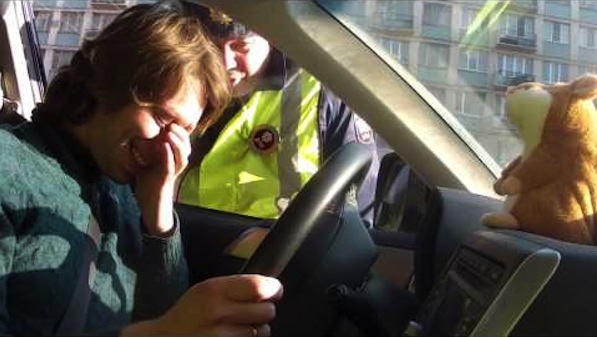 The little mimicking hamster repeats whatever he hears as a man drives around in his car in Russia. When he gets pulled over by a policeman the little hamster continues to repeat what is said and it looks like he is back chatting the scary officer. The only thing more hilarious than the hamster giving it back to the policeman is that the guy driving the car is so amused by his little rodent friend that they almost look like best buddies. Watch as he sings and giggles with his BFF hamster. Eyeball over these lips for a few seconds and you’ll probably get a little ‘creeped’ out. Lets face it us girls love a new make-up trend but this is definitely one we hope NEVER catches on. 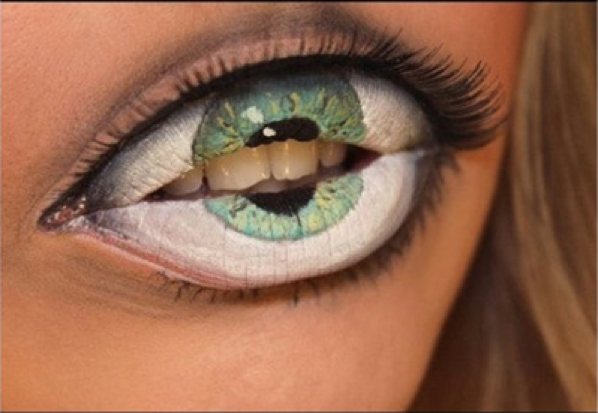 The photo almost appears to be an inversion of the popular meme from 2005 known as Mouth Eyes where people placed their mouth on their eyes using photoshop and then uploaded the images. We found out the photo actually came from Swedish make-up artist Sandra Holmbolm who has even more crazy make-up tricks to check out..
Just when we thought the Harlem Shake hype was beginning to die down, The Simpsons decide to jump on board. The viral dance video that began January 30th from an upload by blogger Filthy Frank has had everyone shaking, with an average of 4,000 video uploads to the internet a day. 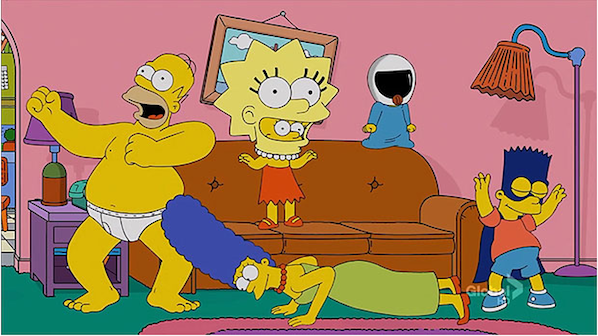 Last night’s The Simpsons show debuted its version of the Harlem Shake aka ‘The Homer Shake’. The famous song by Baauer begins with Maggie giving us an intro, and before you know it the whole of Springfield is ‘Harlem Shaking’ it. Perhaps the Harlem Shake has reached its peak with this cartoon family’s rendition, but you never know who could be doing it next!